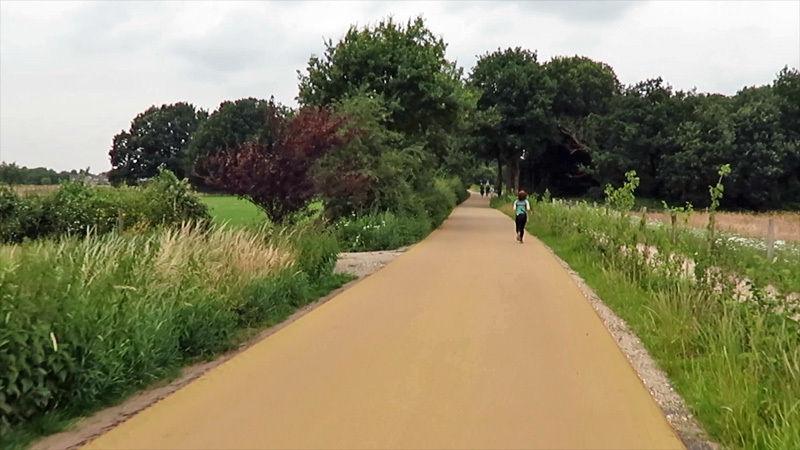 The Maaswaalpad is another beautiful fast cycle route in the Nijmegen region. It was named after the rivers it connects, the Maas (Meuse) and the Waal. The name is also a reference to the other fast cycle route in the region that I showed you earlier. That path between Arnhem and Nijmegen, or the rivers Rhine and Waal, is called Rijnwaalpad. One of two major intersections which were reconstructed. Here, cycling got priority. The new path doesn’t actually go all the way to the river Waal, and it doesn’t really reach the river Maas either. Not yet that is. In the finished state it will even cross that river and continue to Cuijk. The other end, the Waal end, will go to the Nijmegen University area, Heyendaal. For the video I did start near the river Waal. I cycled south from the station square in Nijmegen (because that is also where my video of the Rijnwaalpad starts, but then to the north.) From the station I went on normal cycling infrastructure to the beginning and then on to the current end-point, in the village of Molenhoek at the railway line. An underpass under that railway line has already been built, but it is not yet in use. It took just 76 hours to build that underpass. There’s an amazing timelapse of that! A ramp will start on the other side of the railway, parallel to the railway, to the future cycle bridge over the river Maas that will also be constructed parallel to, but separate from the current railway bridge. At a 40 metre distance at the most. This new route will shorten the total distance with 2.5 kilometres. The old route was 14.4km, the new one is 11.9km. The cycle street in Mook-Molenhoek which was opened last February. The village in the province of Limburg is not completely flat. 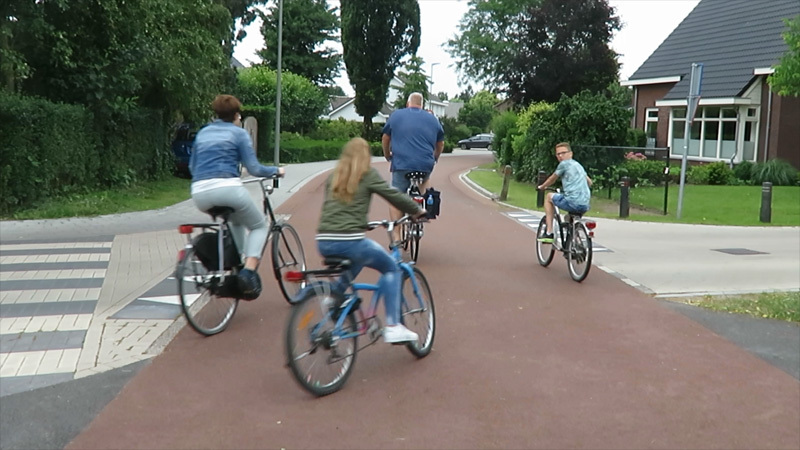 Entire families cycle together on the new cycle route. Most of my ride is on cycling infrastructure that already existed. The crossings with major roads were all upgraded, but most of the changes took place in the village of Molenhoek, just across the provincial border in Limburg. The cycle route in Molenhoek is a cycle street that runs parallel to the provincial road and that serves as a backstreet route. The street got smooth red asphalt to make drivers of motor vehicles clear that they are now guest. 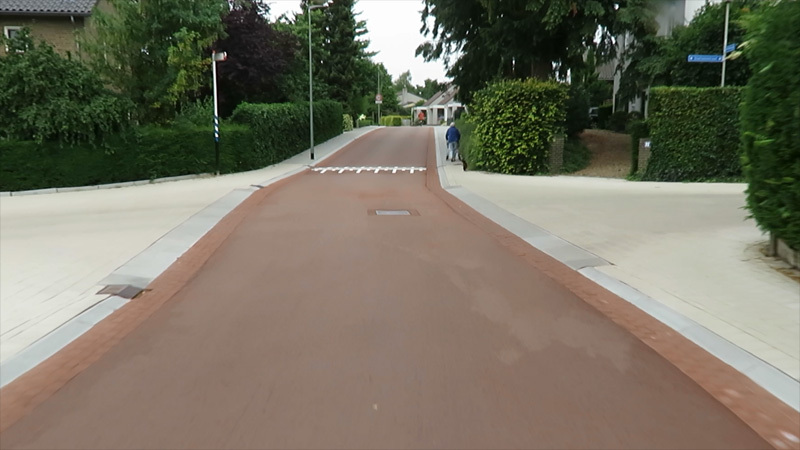 This part of the route, on Middelweg in Molenhoek, was opened on Friday 23rd February 2018. 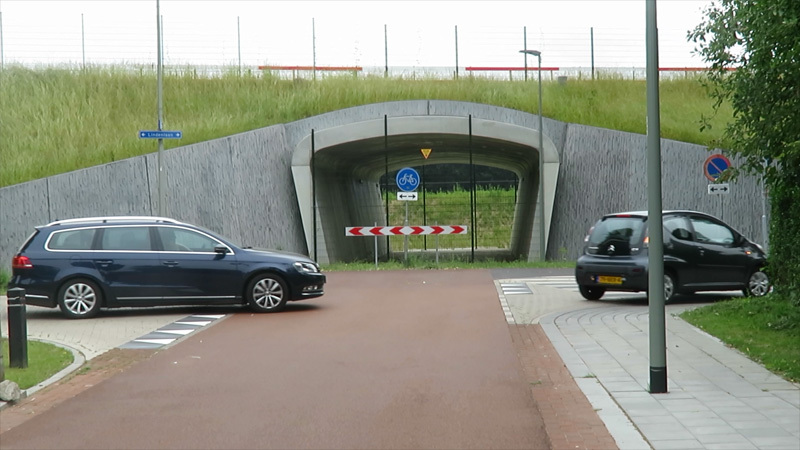 At the moment the cycle route ends at the underpass under the railway line from Nijmegen to Venlo. The route will turn right past the railway and then cross the river parallel to it on a new bridge. At the moment you need to make a detour to get to a ferry across the river Maas to the village of Cuijk in the province of Noord-Brabant. That village was a bit reluctant to already start with their part of the route. 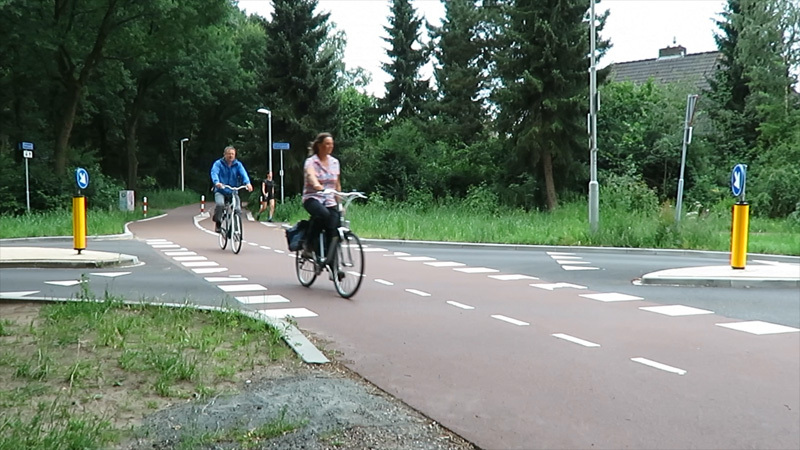 Every municipality is responsible for their own part of the route, but Cuijk felt there was no reason to build anything before it was absolutely sure a bridge would be built and their part would indeed connect with the rest of the route all the way to Nijmegen. But the finances of the bridge were taken care of. The construction is expected to begin early 2019. The budget for the bridge is 12 million euros. The bridge will not replace the ferry. That will remain in service, also in the future. The railway bridge near Mook-Molenhoek. On the other side of the river is the town of Cuijk in the province of Noord-Brabant. The cycle bridge will be constructed from early 2019. From about the same time Cuijk will start constructing the last few kilometres of the fast cycle route MaasWaalPad. The province of Gelderland is coordinator of 8 different administrative bodies which are building the route together. They signed an agreement to build this route in 2015. It is interesting that the website for this route only mentions seven local authorities: four municipalities and three provinces. I think it is safe to assume that the 8th party is the national government, in this case the national road authority. The 8th party was the now dissolved City Region Arnhem-Nijmegen. Since the length of each part of the route in each municipality and province is different, the cost for each of the administrative bodies is different too. Here’s the list of the budgets. Province of Gelderland: €8 million. Making the combined budget €14.2 million. The website states the total budget is €16.5 million. The difference, €2.3 million, will – most probably – have been paid by the national government now dissolved City Region Arnhem-Nijmegen. An exceptional colour for a surface of a fast cycle route. The yellow asphalt is a reference to the dirt-road that this had always been. Although the name seems a logical choice, considering the existence and name of the RijnWaalPad, there was a public name-giving competition in 2017! Out of 800 names entered the jury chose three: MaasWaalPad, Snelfie (a combination of fast and selfie) and De Romeinse Baan (the Roman track, referring to the Roman history that can be found in abundance in this region). People could pick their favourite on a Facebook page and in the end Jack Leenders was the winner: he was the first to enter the name MaasWaalPad. 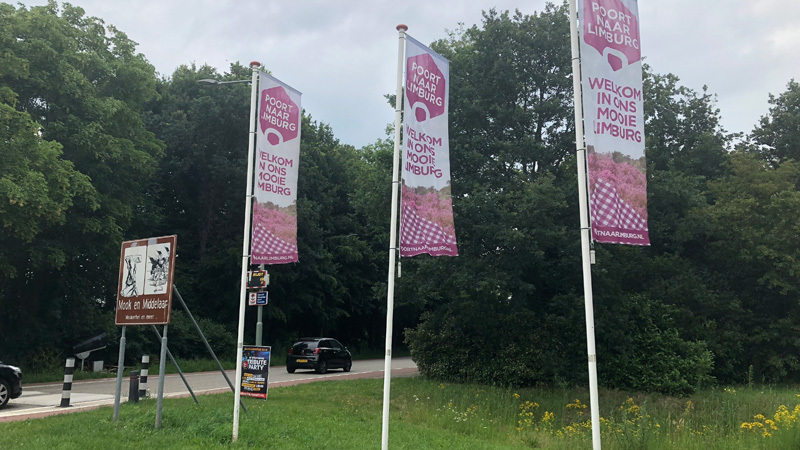 At the entrance of Mook-Molenhoek the province of Limburg proudly welcomes its visitors. 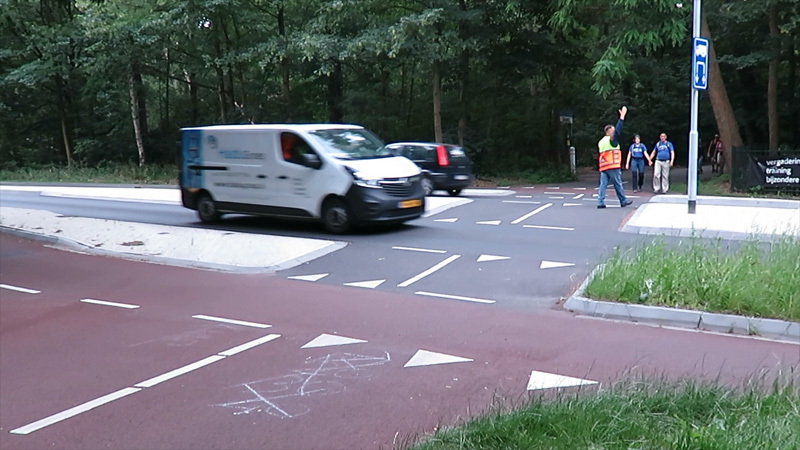 The connection between Nijmegen and Mook is now finished but no signs tell you yet that you are actually using the MaasWaalpad. 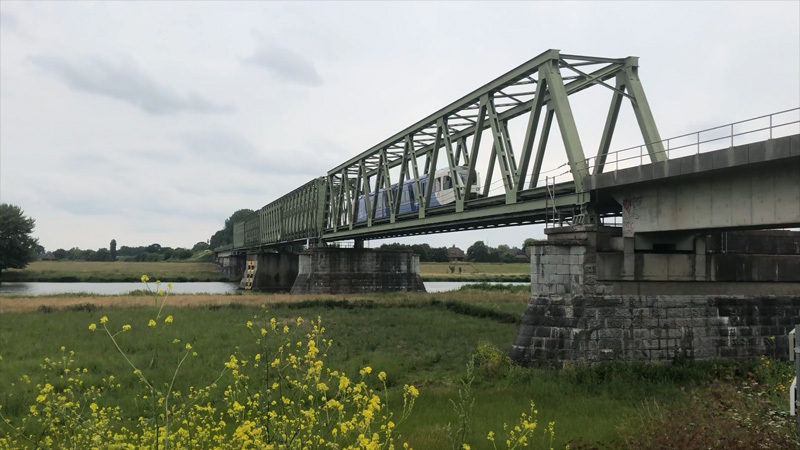 We will probably have to wait for the bridge over the river Maas and the part in Cuijk in the province of Noord-Brabant to be finished in 2020, before signs will be put up. Traffic wardens are not normally present here. But since there was some sort of walking event going on, they were here the day I filmed. The many people walking on the cycleway in the forest are also not normally there. At least not in such great numbers as you can see them in the video. Link to a map of the entire route. A resting place next to the MaasWaalPad. If you are interested in 14 detailed maps of the route you can find them on the website of the municipality of Heumen. My video about the MaasWaalPad as it is partially finished in 2018. That really looks like a peaceful path to cycle on. But I didn’t get it, why is the area named Maswalpad even though it does not touch the rivers on which it is named? Can you please explain that to me? It goes from Nijmegen which is on the Maas to Arnhem which is on the Waal. Nice peaceful enjoyable ride. Great to see all the people out walking. That’s an excellent exercise. Does anyone there do Nordic walking? That’s an even better exercise. It was a hype once, but I don’t see Nordic walking anymore. What number will this F-route have? I think it will be most likely be F73, because the number always refers to the motorway such a route offers an alternative to and that is the A73 linking Nijmegen and Cuijk. – The currently existing railway bridge was sometimes used by cyclists and pedestrians. to cross the river. After a deadly accident happened, fences were put up to restrict access. Thanks Sjors, for this valuable information. I have updated the post regarding that 8th Governmental body. Mark, how is the path of the snelfietsroutes chosen? 3. Going alongside the existing main road. Nr. 3 was rejected because it would be impossible to acheive the quality which fits a cycling highway (comfortabel, direct and few stops) since the route would run alongside a major highway including lot’s of intersections, traffic lights and roundabouts. Nr. 1 and 2. were weighed on about 20 criteria – the most important reasons: the current route links the town of Malden to the path, there was already an existing cycling route which we could improve (benefitting existing users), it was more socially safe and not as hilly (incline of about 20 meters instead of 50-60meters). 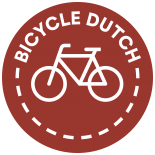 This entry was posted on 10 July 2018 by Bicycle Dutch in Original posts and tagged Cuijk, long distance cycle paths, Molenhoek, Mook, Nijmegen, railwaystations, ride.